Imagine you are on the high seas almost 200 years ago, feet planted on the deck of an 80-foot 1812 topsail schooner, sails, underway, on a well-plotted course. Your safety depends on teamwork, the setting of 5,000 square feet of canvas by climbing ratlines and going aloft. you need to arrive at a safe harbor. Pages from a sea novel? Perhaps. Yet compare those responsibilities and transfer them into a business setting that depends on teamwork, leadership and cooperative vision. A captain and the partnership of his crew is not so dissimilar to those of a development team and a CEO grappling with the same goal — success. Rapid response to unforeseen challenges are what determine survival at sea. The same can be said for challenges in today’s modern corporate settings. What better way to develop strategic leadership and team building techniques than to experience those same ones lived by the stalwart sailors of a privateer crew. 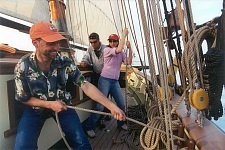 Privateer Lynx offers a unique stage for leadership and management training programs. In order for a ship to perform to its maximum efficiency, she must have order, discipline and the full cooperation of all its crew. Once on board ship, the absence of daily clutter and distraction, and the vastness of the open sea, provides an invaluable setting to reflect on personal choices. All members of the crew must be ready to play crucial roles that eventually all link together for peak performance. Lynx can design specific courses of any length or description that will cater to your business objectives and ultimate goals. Previous sailing experience is not required and programs can be adapted to all levels of physical condition. On-shore meetings, conferences and seminars are also available on board Lynx, with optional day sails. Consider the unique marine environment and its unpredictable tone. Embrace the idea of working in harmony and discovering diverse strengths that have yet to be tested. Combine the physical with the mental while facing nature’s demands head on. Once back on the mainland, the experience is yours to own and apply to your professional and personal lives. The view from your office chair will somehow never be the same again. For more information on Lynx tours, voyages, charters, sailing programs, job opportunities and merchandise email The Tall Ship Lynx at: info@tallshiplynx.org or call 727-474-4727.